Two young UGA business graduates left the corporate world to become social entrepreneurs and raised $1 million to help Georgia children impacted by AIDS. Now they’re ready for the next leg of their journeys. Put yourself in Garrett Gravesen’s polished, square-toed loafers: You’re 28, a handsome, rail-thin 6’, and in only five years have far exceeded the University of Georgia’s great expectations for its youngest-ever student body president and one of its business school’s brightest stars. The enterprise he founded in 2003 with friend and fellow b-school standout Ryan Gembala, 27, took in $1 million last year. Their idols – legendary coaches Vince Dooley, Mark Richt and Paul Hewitt – serve on their board of directors. This month, the two plan to announce the hiring of a new executive director, an expert who will run and grow their organization from a Georgia operation into a national entity. Gembala and Gravesen will “graduate” to join their heroes on the board, and seek new and divergent professional paths. You keep climbing, of course. But Gravesen and Gembala’s corporate ladder – and clients – differ from the usual business model. And as it turns out, these two former partners are focused on very different next steps. Inside, the atmosphere is anything but dismal – it’s crammed, but clean, and its residents are as sunny as the spring day. The children dive excitedly into Gravesen’s gifts of books and reading games. The toddler bangs a spoon on a jar of jam, eager to open it. The little girl puts the groceries in a small refrigerator, careful not to muss her frilly princess dress, brought by a friend to wear today, her birthday. You might never guess that in addition to other obvious hardships, the family is struggling with another, invisible burden: The family matriarch, asleep under a bedspread after a night shift at an all-night diner, is HIV-infected. Her 18-year-old daughter, the toddler’s mother, blinks back tears when she recalls meeting Gravesen for the first time. “I guess I just kind of broke down,” she says. Meet Gembala’s and Gravesen’s “clients,” and the organization they founded to serve them: HERO (Hearts Everywhere Reaching Out) for Children, dedicated to improving quality of life for HIV/AIDS “infected and affected” kids. Their organization matches those young people (“Little HEROes”) with volunteer mentors (“Super HEROes”), who provide positive influences, help with homework and encourage and support some of Georgia’s neediest – and smallest – outcasts. In the last few months, the program has stretched beyond Atlanta and Athens to Macon and Augusta, serving more than 350 kids. Before graduating in 2003, the two were typical, fraternity-partying, rabid Bulldog football fan collegiate pals, except, perhaps, for their ambition. Gembala, who speaks four languages, won the campus-wide Vision Award for founding the UGA chapter of an international internship program. Gravesen became student body president while still a sophomore. His UGA graduation day speech is, usually, the first hit for anyone who Googles “student commencement speech,” topping even Hillary Clinton’s – five years after he gave it. More recently, Gravesen engineered his way into a UGA meeting with the six living former U.S. secretaries of state on little more than chutzpah, cracking up Colin Powell with his claim to be “most likely future Secretary of State,” and eliciting Madeleine Albright’s command to meet with her at Georgetown. Two of the Kenyan IT firm’s secretaries were HIV-positive, as are 13 percent of that country’s adults. The number of Kenyan orphans left by AIDS is estimated at 1.2 million, many of them infected themselves. Deeply affected by the fact that so many people’s destinies seem determined by the time and place of their birth, Gravesen began volunteering at a nearby AIDS orphanage. Playing games, singing songs and telling stories about a mythical creature from his homeland, a mighty Bulldog, Gravesen found that despite the constant grief and sickness, giving joy to the children who called him “GG” had an unexpected side effect: It gave him joy too. On another continent, in another hemisphere, Gembala, who has the reserve and tousled good looks of a young Harrison Ford, was polishing his Portuguese while he polished off a few caipirinhas with Brazilian colleagues from his internship program. When the conversation turned to Brazil’s AIDS epidemic, with more than 620,000 infected people, they asked if he’d ever seen a person with AIDS. “No,” Gembala said. “Would you like to?” they asked, and Gembala agreed. They arranged a visit to a nearby AIDS orphanage. “I knew better than to show up at an orphanage empty-handed, so I took chocolate, balloons and bubbles,” Gembala says. “All these little kids came running out, and the littlest were most excited – they could see the plastic bag hanging from my arm. I took out the chocolate, and there were smiles, giggles and cheers. I took out the balloons – smiles, giggles, cheers. Then I took out the bubbles: Blank, confused stares. I thought, ‘Everyone has seen bubbles before.’ Even after I took out the wand: Nothing. And then I started to blow bubbles … and their little eyes lit up like Christmas tree lights.” The kids were enchanted with their newfound discovery. So was Gembala. Gembala had been among the friends to whom Gravesen had sent his regular emails describing his experiences in Africa. When they returned to Athens, they compared notes, and decided to chuck their pre-ordained trajectories to six-figure salaries to do … something. Most of us turn away engulfed in despair and helplessness at the world’s overwhelming miseries, but Gembala and Gravesen viewed their goals pragmatically, with the analytical skills they’d learned earning finance and management degrees. “With our personalities, we knew we wanted to do something that no one else was doing, and that would be around long-term,” Gembala says. Before long, they learned that what they wanted to do most – provide good friends and positive mentors to kids with AIDS – wasn’t addressed by any organization in their state. Or the nation. Or, as far as they can tell, the world. Five hundred organizations in Georgia are devoted to AIDS, but only 12 of those help kids. All 12 provide basic needs such as food, housing and medicine. None deal with the trauma and loneliness of being a child with AIDS. With 12,000 affected kids, Georgia ranks eighth in the U.S. in pediatric HIV rates. Most infected children come from the poorest populations. Their parents’ average income is $10,000 a year; the kids’ inner-city neighborhoods are often hotspots for crime and drug abuse. Gembala and Gravesen devised a plan, and enlisted every family member and resource they could tap. Gembala’s father, a vice president at Blake & Pendleton, a Norcross air compressor distributor, arranged for them to occupy unused office space there. To make their shoestring budget work, they made perhaps the ultimate sacrifice for two popular young BMOCs: They moved back in with their parents. Gravesen and Gembala pronounced themselves co-founders and co-executive directors of their new organization. They would begin by offering “HERO for a Day” activities-for-kids group programs; but eventually, the goal was to raise enough money to devise a one-on-one mentoring program for children who were HIV positive or had lost a mom or dad to AIDS. Sometimes the kids fit all three categories. Initially partnering with Big Brothers and Big Sisters, Gravesen and Gembala began with a similar prototype: SuperHEROes would agree to meet with their “Little HEROes” twice a month for a year, giving the kids role models and everyday support. Gembala and Gravesen knew they eventually would have to design their own programs, and consultants such as Emory University’s Rollins School of Public Health don’t come cheap. “We knew everybody, and pulled in every favor we had,” says Gembala, whose friends began calling the sofa “the Gembala couch,” because he often crashed there. The partners admit they lived in their cars “for about six weeks,” while they knocked on doors, defined goals, practiced pitches, asked for advice. “We became experts at ironing on people’s kitchen tables,” Gembala says. Their luck began to turn when they earned meetings with UGA’s former athletic director Vince Dooley and football coach Mark Richt. “We wanted to build our brand around real heroes who had integrity and did the right thing,” Gembala says. “We had a dream to sell,” Gembala says. “At first, we thought he was kidding,” Gembala says, “but of course he was right.” Soon, with Dooley’s help, Georgia Tech head basketball coach Paul Hewitt was on board. With the biggest names on campuses now sitting on their board, HERO had a calling card that would earn them entry into the state’s leading corporate offices. Soon, the Atlanta business community also joined the effort, including UPS, Morgan Stanley and Georgia Natural Gas, Sherwin-Williams. Even small supporters such as Luckie Food Lounge made big contributions. “I feel our generation’s cause is HIV/AIDS,” Gravesen says. “We think we’ll eventually be the biggest collegiate philanthropy in the country.” They’re already on their way: HERO is UGA’s No. 1 collegiate philanthropy. In those first years, $30,000 allowed HERO to hire consultants from the Rollins School of Public Health to devise both a training program for mentors and a curriculum for their “clients.” The only training program of its kind in the United States, it allows mentors to speak knowledgeably about how AIDS “affects the bone marrow cell, so the kids are often smaller,” says former fraternity brother and SuperHERO Jon Vaughan, and allows trainers to bring to the fore volunteers’ deeply hidden prejudices or biases, so that they don’t erupt later, with the children or their families. It’s a program Gravesen and Gembala hope can be exported wherever there is need. Rising HEROes is a curriculum devoted to building young clients’ life skills – keeping a budget, holding a job, expressing anger productively. Vaughan’s Little HERO, who was at first so shy he barely spoke, has become a lively, outgoing young man who was “the hit of my wedding,” Vaughan recalls, laughing. “I think he danced with everyone.” His grades have also gone from D or failing to honor roll. 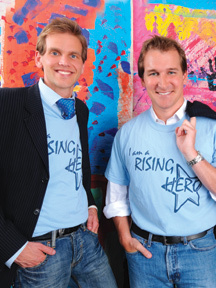 In 2006, raising $500,000 meant HERO could at last hire two employees. However, last year’s December gala was a blowout, with Food Network star Paula Deen and her two sons helping to bring in $580,000 in a single night. It was Deen’s first-ever Atlanta charity; Gembala won a meeting by leaving a message on Deen’s Savannah restaurant’s answering machine. The event was the largest fund raiser for pediatric AIDS in the Southeast. The two already have mapped out their next goals – as different as their life-changing experiences were similar. Gembala has been accepted into the University of Chicago’s prestigious MBA program, where he intends to gain the skill sets he’ll need to become CEO of another enterprise with a social mission. Sound ambitious? Remember, he’s got Madeleine Albright’s phone number. And an amazing knack for serendipity: Over Christmas, Gravesen accompanied a friend on a backpacking tour of Southeast Asia. Arriving in Bangkok, Thailand, he called a friend who’d lent her name to the HERO cause: Natalie Glebova, 2005’s Miss Universe, who is married to Thai tennis star Paradorn Srichaphan. “Where are you staying?” she asked. “In hostels,” Gravesen stammered. “Why don’t you just stay with me?” she responded. Soon, Gravesen and his friend were being chauffeured to her luxury condo in the car she’d sent – a 2008 Ferrari. In their Norcross offices, Gembala and Gravesen point to a photo of themselves with the stunning Glebova, who has made HIV her signature issue. Well, says a reporter, that photo shoot must have been a tough gig.